Gather your vaccination records! Find your child's birth certificate and social security card! It's time to register new students for Pre-K and Kindergarten!! 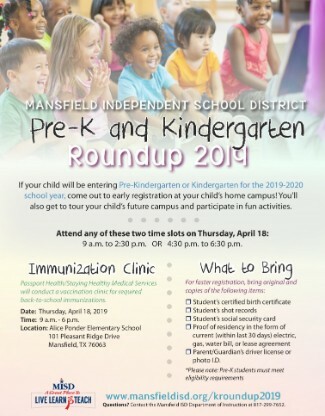 MISD Pre-K and Kindergarten Round Up will be on April 18 from 9:00-2:30 and 4:30-6:30 in the Tarver-Rendon library. Students who are not currently enrolled in MISD need to complete the online registration process. 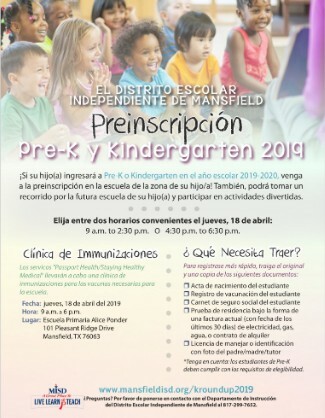 Pre-K and Kindergarten registration opens on April 1. Students in other grades may begin enrolling on May 1. For detailed information of what to bring with you when enrolling a student, as well as step by step instructions for the online registration, visit the district registration web page.